Description: Red crown cap. 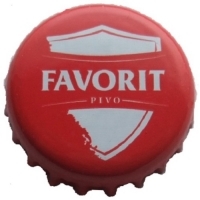 White logo of a shield, red label with white text: FAVORIT PIVO. Factory sign: MGM (NewBox Yugoslavia).